Sarasota is one of the most attractive and friendly small cities (population 55,000) along Florida's Gulf Coast, just an hour's drive south of St. Petersburg and 75 minutes' drive south of Tampa, but it's more laid-back and far-less developed than these larger Floridian cities. Located just south of picturesque Bradenton and fringed by the gorgeous barrier islands of Siesta Key and Long Boat Key, both of them famous for their white-sand beaches, downtown Sarasota has a growing number of hip and trendy restaurants, bars, galleries, and arts venues. Although Sarasota's only entirely gay club, the Throb Nightclub, closed down in 2015 after a fire broke out—which was later ruled intentional arson— a number of the other venues in the area cater to the LGBT crowd on certain nights of the week. Sarasota's only remaining gay-owned and operate venue is the Barrel 87 Saloon, located on the south side of the city, fairly close to Siesta Key. This inviting gay neighborhood bar offers a variety of fun theme nights and drink specials throughout the week, but be sure to check out karaoke on Sunday nights and Throwback Thursdays, which both bring in big crowds. For a more curated experience, consider becoming a member of the Purple Rhino Lounge, a private non-profit gay bar and community center that one reviewer referred to as being "like a gay 'Cheers! '"—where everyone knows your name. All bar staff works on a volunteer basis, so remember to tip your servers well, and all proceeds from the bar go to help maintain the Purple Rhino Lounge as a space for the LGBT community as well as efforts toward Red Ribbon (HIV) Services in the area. 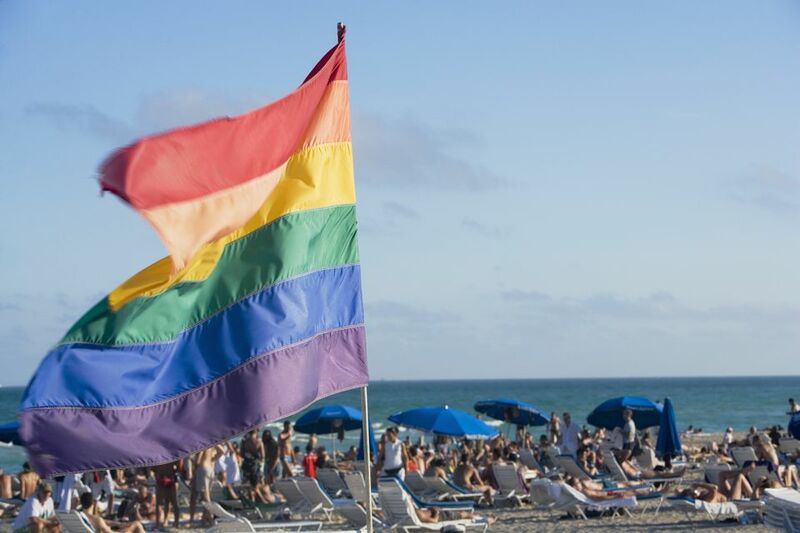 Although the Purple Rhino Lounge and the Barrel 87 Saloon are the only two official gay bars in the city, most of the restaurants and bars around Sarasota are gay-friendly. For this reason, a non-profit party organization known as Gay Group Happy Hours (G2H2) began hosting monthly events at restaurants and bars around the area where LGBT residents and visitors could get a chance to network, enjoy one another's company, and discuss the burgeoning gay scene in Sarasota. On the first Thursday of each month, Sarasota's Gay Guy Happy Hour invites members to share a meal at upscale and sophisticated lounges and restaurants either in downtown Sarasota or in neighboring beach communities. Venues that have hosted these gay happy hour socials, which also draw a fair share of lesbians, have included the contemporary downtown Asian fusion restaurant Tsunami Sushi & Hibachi Grill, the trendy regional American eatery Louie's Modern, and the Nuevo Latino grill Selva. Membership fees cover basic costs of running G2H2 as well as providing support for the many charities the organization provides for in the Sarasota and Tampa area. G2H2 also hosts 50/50 raffles each month where the winner receives half of the prize money and the other half goes to support charities focused on LGBT awareness and well-being.